Kanban is a visual signal that’s used to trigger an action. Kanban is used as an inventory control system that relies on visual signals to indicate steps in an organization’s manufacturing process. Translated from Japanese, Kanban means “signboard” or “billboard”. In a manufacturing application, Kanban begins when a customer’s order is received, and from there production flows. VMAC employs LEAN Manufacturing methodology, where parts are only produced when there’s a Kanban signal for it. Kanban can be referred to as a “pull system” as all parts are pulled from the customers’ orders. Example of the clothes pin system in effect. This system is used within VMAC’s LEAN Manufacturing operations. 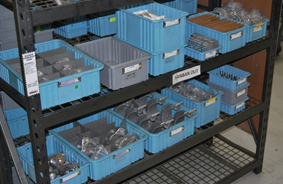 VMAC has a few different Kanban methods: Kanban labels are placed on the front of parts bins with information such as the part number, the name of the part, the number of bins of its kind, and the quantity for refilling the bin. Visual signs (Kanban) are used to notify coworkers of empty bins. In some cases, the bin will be turned around so the label is facing the back, or in other cases a red clothes pin will be pinned to the bin. The system provides a consistent method for coworkers to visually identify when parts need to be restocked. An optimized Kanban system streamlines workflow in a sustainable way. The inspiration for using a Kanban system in manufacturing was born when Toyota engineers noticed that grocery store clerks restocked their shelves based on their store’s inventory, rather than their vendors’ supply. Items were only ordered when their current supply on the shelves was about to sellout, resulting in less waste for the store, and more consistently stocked shelves for their customers. How Does the Machine Shop Kanban Work at VMAC? Full bins in the machine shop are ready to be picked up or distributed back to Internal Customers. 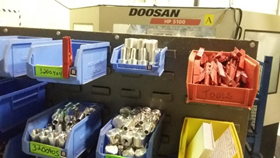 Stock shortages and empty parts bins at VMAC are constantly monitored, and to prevent shortages that create production bottlenecks there is a Kanban system in place in the machine shop. This system allows for parts to be made on an as-needed basis. Production coworkers, “Internal Customers”, request more parts from the machinists, “Internal Suppliers”, when the inventory is low. Typically, the system will be set up with two bins (or more) per part. At the end of each day, Internal Customers will take their empty bins to the machine shop to have the bins refilled. Bins are clearly labeled and there are designated areas for empty bins to be dropped off. Once refilled to the maximum quantity outlined, the bins are placed in the full bin section for pick-up or distribution. For this system to work, the time it takes to replenish a batch of parts must be shorter than the time it takes to use all the parts in the second bin, otherwise the second bin will run out of parts before the first bin is refilled, creating a bottleneck in production. To keep production flowing smoothly, there are guidelines that must be followed. Each part has its own minimum and maximum levels, which are noted on the Kanban labels on the bin. No new parts in the Kanban system are to be produced by the Internal Suppliers without an empty bin being present, and the quantity produced cannot exceed the maximum quantity number on the bin. No partial stock can be withdrawn, only full bins may be returned by Internal Suppliers. If multiple bins of the same part are queued to be refilled, first-in / first-out (FIFO) rules apply. The Kanban system plays a vital role in VMAC’s LEAN journey, which seeks to maximize value for customers while minimizing waste. By using the Kanban system, VMAC can focus on continuous delivery of parts to the production department responsible for building VMAC air compressors and multipower systems. By ensuring parts are available when they are needed, VMAC’s production teams can avoid bottlenecks in the manufacturing process, increasing the teams’ productivity. This translates into improved lead times for those ordering new products, which offers clear value for customers. Meanwhile, waste from the over-production of parts, defective parts, and waiting is minimized. Producing smaller batches of parts allows for agile iterations in the parts resulting in fewer obsolete parts leftover if a sudden change needs to be made. Kanban is in effect currently at VMAC, and has been continuously evolving and improving since its implementation years ago. Though this article mainly describes the Kanban system for parts in the machine shop, the next step is to have a Kanban system set up for VMAC’s finished products, such as the diesel, gas, and hydraulic driven air compressors. Once in place, lead times for these compressors will be greatly improved. 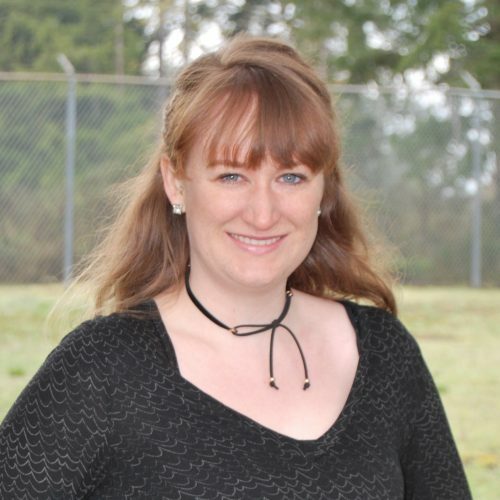 Interested in learning more about LEAN Manufacturing at VMAC? Browse our LEAN Blog Series, which includes the 5S program.